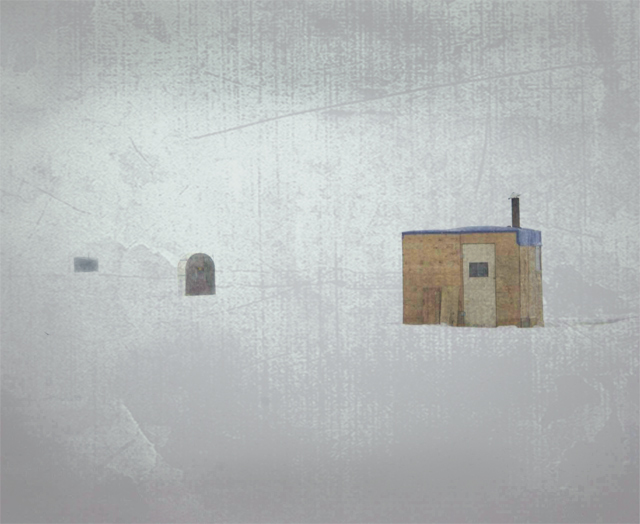 Ice fishing shacks on the Ottawa River, receding in the snow. I really like the composition/overlay on this one. Love all the white space. Must of missed it in February. What a peaceful place... captured as art.... well done my friend, favourite to me. Excellent shot Bill. The overlay - or window really nails the image. Glad to see you picked up the 80-400 as its a great lens. Hope you cleaned the fish and not Denise! ;-) Tessa and I send our regards. Beautiful shot and use of the texture. I love the receding line of the shacks. Good effect appears like dim visibility and these days in the storms the fishing shanties look like this..
We've had some warm spells too and noticed the other day water on the ice but the fisherman were out there just the same on the lake near by..
An 80 yr old man lost his life recently drove his truck on the ice and went thru.. UH! LOVE this, Bill. Way to go with the overlay! A beautiful, minimalist composition. I find the muted colors and shapes to be so appealing. Proudly hosted by Sargasso Networks. Current Server Time: 04/21/2019 12:21:18 PM EDT.